By now, most people know that we still live in an era where the cheesy ‘content is king’ cliché still holds true. Search engines want your site to do more than sit there and blogs give you the opportunity to get up off the bench and dance with the rest of the marketplace. They also give you the chance to hock new products, share advice and connect with your customer base in new and compelling ways. 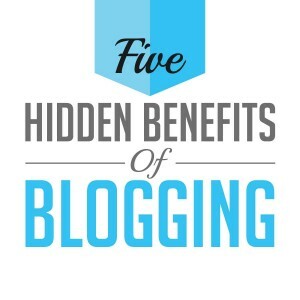 For those who are highly capable bloggers, it can even become a secondary source of income. But that’s not all blogging can do. This week, we’ll talk about some of the hidden benefits of blogging and how they can help your website and business grow. They help provide a core for a book – When you sit down and even think of the possibility of writing a book, the idea alone is overwhelming enough, never mind your finding the time to actually get it done. But believe it or not, blogging is a sure fire way to get there if you’re patient. Many bloggers have been able to turn their posts around into books and in some cases, publishers have approached them about writing a book around their topic du jour. Obviously, writing a book is a sure fire way to supercharge your reputation and create another source of revenue. It’s an opportunity to share more than words – A blog post doesn’t always have to be a bunch of words explaining something. Sometimes it can be a cool design, a video, an interesting graphic or photograph. Blogs are a versatile communicative tool and can help you flex your muscles in a variety of different ways – some of which you may have never considered before. They improve your communication skills – While we can talk about the importance of the quality of our individual capabilities– winners and losers in the business world are almost strictly defined by their ability to communicate with their audiences. Blogs are a constant excersize in the art of communication and can help you gain critical insight not only into what your cutomers wants and needs are – but what yours are as well. Blogs can help cultivate your communicative ability and offers up a tremendously versatile platform for you to be able to grow those skills with. Low cost way of cultivating a voice and spreading your message – Blogging can cost a little money and a little time, but in the big picture, it’s one of the most affordable means to help boost your profile – whether that’s through search engines, new media or by gaining authority. At the end of the day, blogs are one of the most effective ways to demonstrate, communicate and promote your brand and capabilities. Given their relatively young age, we’re just beginning to learn how powerful they can be – and some of those powers we’ve yet to uncover. Just remember – stay consistent, stay persistent and your blog will be a boon to your business.